Two weeks ago (it’s been half term for me! ), the patients at Cavendish Hospital in Buxton and Newholme Hospital in Bakewell looked at the theme of Buxton itself. Buxton is a town in the high peak of Derbyshire which has been a spa town since Roman times, and is world-famous for its mineral water today. The town is full of beautiful buildings, dating from the eighteenth century to Edwardian times, including the exquisite Buxton Opera House, and the former Grand Stables, which became the Royal Hospital, one of the country’s leading centres for hydrotherapy. The central dome of the building was once the world’s largest unsupported dome, with a diameter of 44.2 metres! It’s now part of the University of Derby, also open to the public. 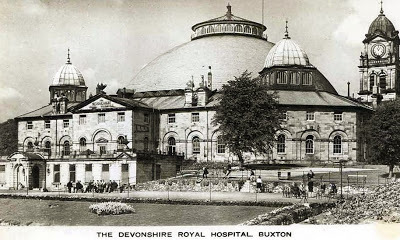 The Devonshire Royal Hospital with its huge dome! You’ve been down them all. A robber once used it as his den. See the countryside for miles from here. At St Ann’s well, the water is free. But it’s now sold all around the world. The rain fell five thousand years ago. To the grand old crescent. From headaches to ingrowing toenails! They all took the waters at the pump house. Warm, with its coppery taste. Was the town’s library and registry office. Things were more vibrant in our day. The Beatles played in the Octagon. We were there! Now it’s all craft fairs. The rain and wind, and the flow of the Wye. And the welcome and the water is warm.